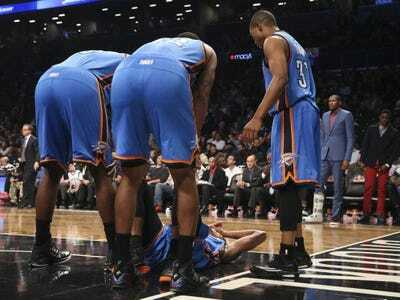 John Minchillo/APThe Oklahoma City Thunder gather around injured forward Andre Roberson. Back-up guard Andre Roberson went down with a sprained left foot against Brooklyn and had to sit out Tuesday night’s game against the Toronto Raptors. Thunder have two players with five fouls (Jackson and Ibaka). They’re dangerously close to having only five available players. Now Steven Adams had five. Believe the rule is a team can’t play with 4. If 3 foul out, one stays in and you get a tech for each extra foul. 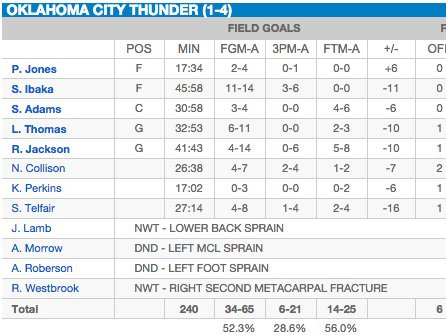 Luckily, for the Thunder, they don’t play until Friday night, so they could possibly get some of their players with minor injuries back for the game. If the Thunder want to bubble wrap their remaining healthy players and keep them isolated until games, nobody would blame them.